BAKU, Azerbaijan (AP) — Luck shone on Lewis Hamilton as he returned to the top of the Formula One drivers’ championship Sunday with victory at the Azerbaijan Grand Prix. Vettel led for much of the race, but was stuck in second behind Hamilton’s Mercedes teammate Valtteri Bottas when a crash between the two Red Bulls brought out the safety car. “Very mixed emotions from today,” Hamilton said. He was late to the podium celebrations because he went to speak with Bottas, who “deserved” the win. 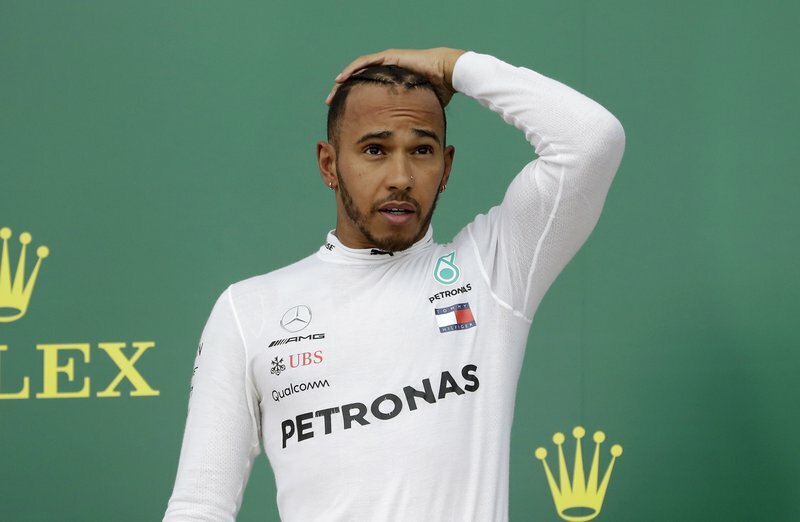 “I wouldn’t have got by him in those laps if he hadn’t had that tire blowout,” Hamilton added. Despite taking the standings lead for the first time this season, Hamilton said the win didn’t mark a turning point in the fight with Vettel and Ferrari. Ferrari’s Kimi Raikkonen claimed second place after having dropped to 14th following an early collision, but said he wasn’t satisfied with his drive and he had struggled to get the best out of the Ferrari. Sergio Perez overtook Vettel after his mistake on the restart, and held off the four-time world champion to claim third place. It was his and Force India’s first podium since 2016. The two Red Bulls driven by Max Verstappen and Daniel Ricciardo fought all race for fourth place. After several dramatic near-misses, they collided on lap 40 when Ricciardo — the winner of the last race in China — ran into the back of Verstappen under braking at the first corner. That sent them both off the track. Both received reprimands from the stewards. Romain Grosjean crashed under the safety car on lap 42, sliding into the wall while weaving in an attempt to heat up his tires. That delayed the restart, and when it came Vettel charged down the inside of Bottas but couldn’t slow enough to make the corner and went onto a runoff area. Hamilton leads Vettel by four points, followed by Raikkonen and Bottas. Ricciardo’s second retirement this season leaves him fifth, 33 points off the lead. The Australian has said he could leave Red Bull next season in search of a car capable of challenging for the title. Sergei Sirotkin ran into the back of Perez, causing contact between several other cars. That in turn left Fernando Alonso limping back to the pits with two punctures and Sirotkin out of the race. The Russian has been given a three-place grid penalty for the next event in Spain. The drama continued at the next turn, where Raikkonen’s aggressive lunge at Force India’s Esteban Ocon plunged Ocon into the wall and out of the race. Raikkonen needed to pit for a new nose and his chances of a podium finish appeared over. Renault’s Carlos Sainz and Nico Hulkenberg briefly stormed past both Red Bulls into fourth and fifth, but Sainz lost his spot when he pitted, while Hulkenberg’s race ended with a slide into the wall on lap 11. Sainz climbed back into fifth thanks to the turmoil ahead of him, claiming Renault’s best finish since Vitaly Petrov was fifth in Canada in 2011. Charles Leclerc was a career-best sixth for Sauber. The McLarens of Alonso and Stoffel Vandoorne were seventh and ninth, sandwiching Lance Stroll’s Williams.